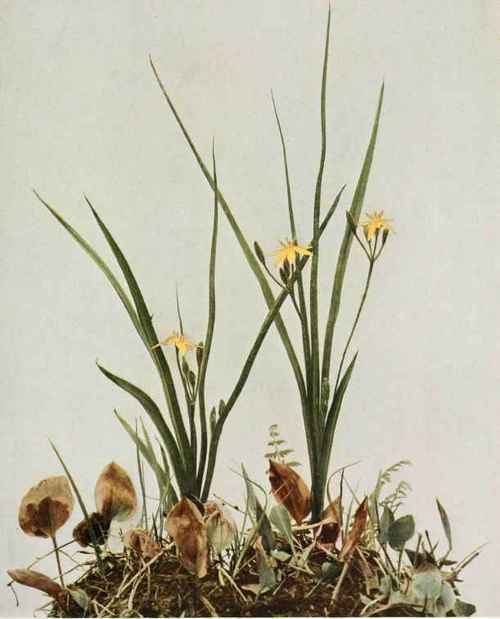 A low, perennial herb with the leaves all basal, narrowly linear, one-eighth to one-fourth of an inch wide, more or less villous and mostly longer than the flowering stems, from an ovoid or globose corm, one-fourth to one-half of an inch in diameter; flowering stems erect, slender, villous above, usually glabrous below, 2 to 6 inches high, bearing at the summit an umbel of one to seven flowers; perianth six-parted, its segments narrowly oblong, spreading, equal or nearly so, obtuse, bright yellow within, greenish and villous without, one-fourth to one-half of an inch long; stamens somewhat unequal; the style rather shorter than the stamens and three-angled, the stigma decurrent on the angles; capsules in fruit about one-eighth of an inch in diameter, the black seeds angled. In dry, especially sandy soil, in fields, thickets and open woods, Maine to Ontario, Assiniboia, Kansas, Florida and Texas. Flowering in May and June, but frequently putting up additional flowering scapes as late as August and September.